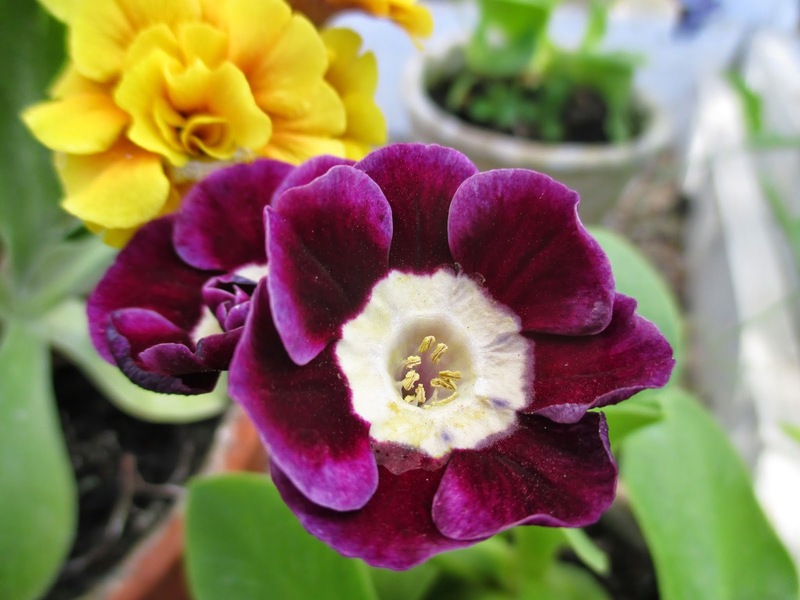 Hi Jane, you have some beautiful Auriculas! They have come into flower in my garden/greenhouse too. Will show them on my blog after Easter. I have the same experience as you have, they are not difficult at all. 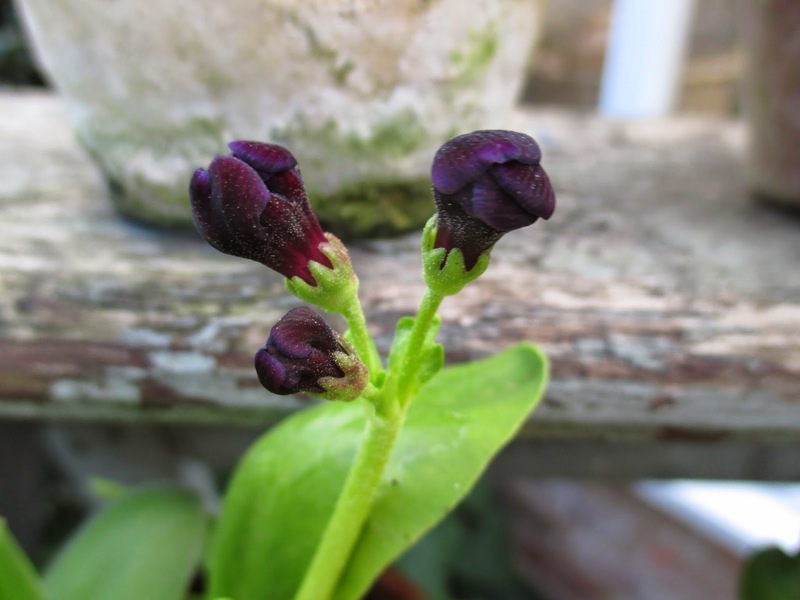 Hi Janneke, looking forward to seeing your Auriculas ! Happy Easter to you. Hi Sue, yes, it is a very old pair of stepladders, renamed as a 'Theatre', so cunning that no one would notice !! I agree with you that they are just not the same as a garden plant - I love the idea that they are a collection , and think there beauty is enhanced when they are together. I have tried plastic pot inside terracotta, but have found that terracotta alone works just as well for me. What gorgeous flowers and amazing colours ! Hi Ela, many thanks for your comments and Happy Easter to you too ! Hi Jane, I used to hate those plants, but now I have changed, mellowed and appreciate them for what they are - very cute, and theie history is fascinating. They must have looked fabulous massed naturalized in Alpine meadows.I wonder if they are still found as wildflowers? Hi Sue, funny, I used to hate them too, but have mellowed somewhat! I am also a sucker for any plant which comes with a lot of history. You've a super wee collection there Jane - your 'Ladder Theatre' is lovely. I think it adds to the rustic quality of the plants or even character. 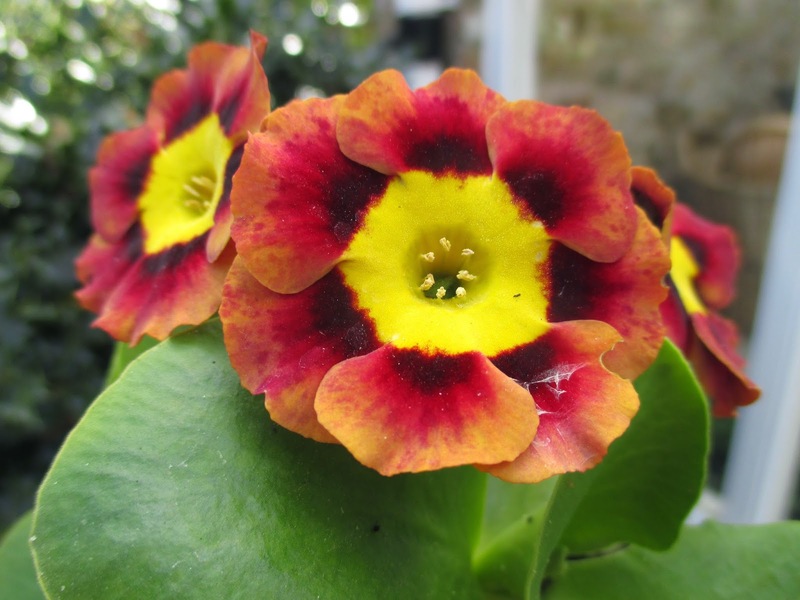 I've seen some rather garish Auricula Theatres but I really like how you've displayed them. Hi Angie, I think 'rustic' is a kind way to describe my 'theatre' , but I like it ! I like them too, but I confess I have struggled. Maybe it's because I've gone for the more complicated ones.. the more farina the better.. I've never had one last longer than a year. Must try harder! 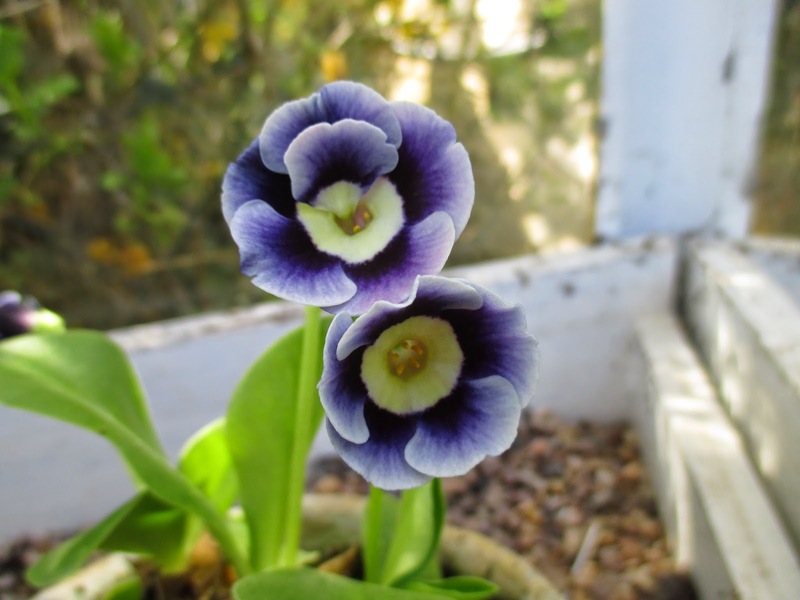 Hi Jane, you have certainly the most wonderful collection of auriculas! I have only seen one other collection on our travels in England, when they were not in bloom so far, and I am amazed by the variety of color that yours come in. My top favorite being the blue flowering one, truly stunning bloom! I am glad to see that you decided to grow your beauties in terracotta containers. The beautiful patina on the pots adds so much to the display of the plants. Can you imagine to photograph them on the wooden step ladder in plastic pots? 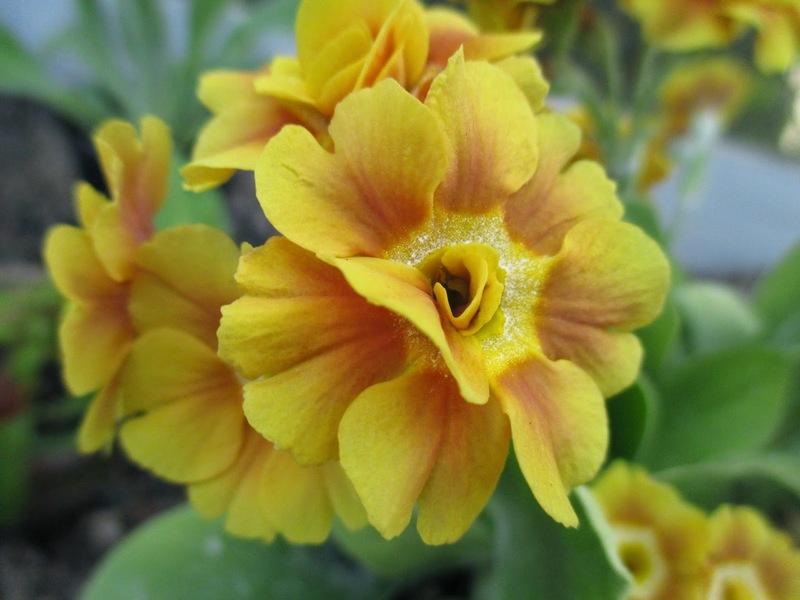 Thanks for the heads of the history of the auriculas. Wishing you a Happy Easter with lots of sunshine! Hi Christina, thanks for your comments. A shame the other collection you saw in the UK was not in flower, as photos do not fully do them justice - particularly the 'Farina' ones, which have a sprinkling of seemingly grey dust on the leaves. It is almost like frosting and most unique. They are special plants and I like the way you displayed them, individual pots on a theatre which also reminds me of how thy aree displayed too in traditional and old glasshouses. 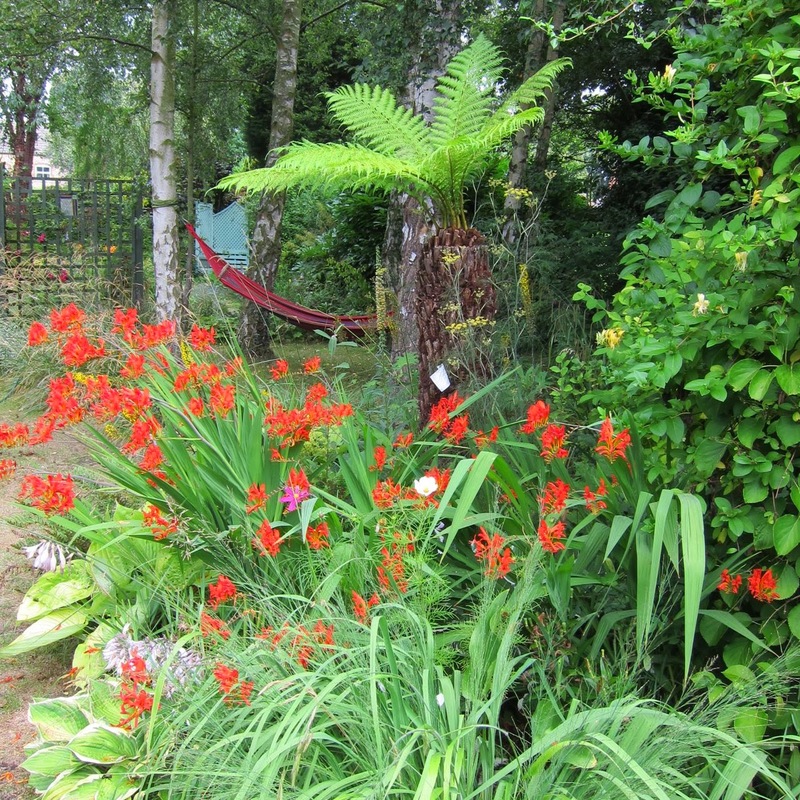 As individual plants in pots you get to appreciate their beauty even more. Hi Mark & gaz, they are special, you are right, and I think they encourage obsession in the same way that sweet peas, roses and giant vegetables do!! 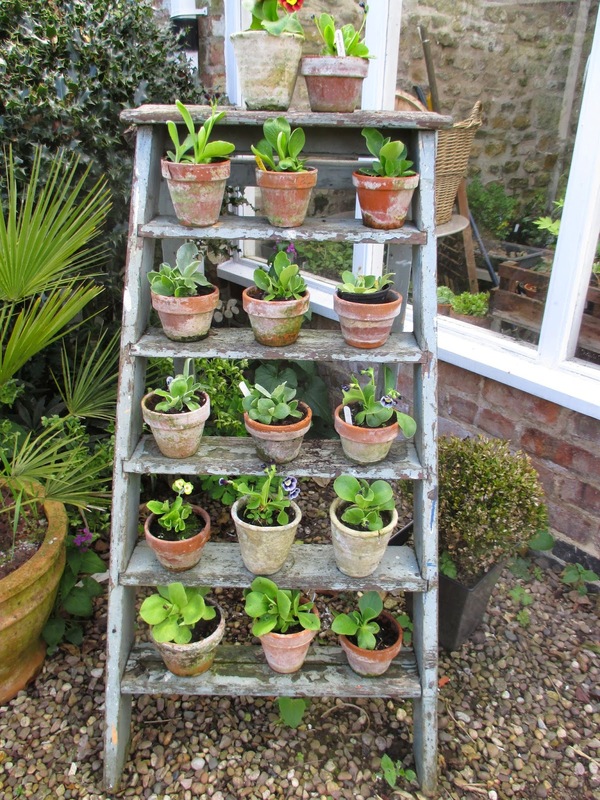 I love your ladder staging and all those terracotta pots, so much more characterful than plastic. I always hated auriculas, found them too stiff, but just like dahlias, gladioli and more recently, chrysanths, I find myself warming to them. Maybe its aging. Either way, I loved seeing your collection, and can quite see myself starting one myself once I feel as if I am in charge of this garden, rather than it being in charge of me! As to being away for a whole fortnight at this time of year, that must have been a shock, I notice things opening and changing on a daily basis at the moment, everything is moving so fast it is exhausting to keep up with. Hi Janet, I wondered if ageing is something to do with it, and as you mellow you can see the pleasures in most things ! I hated them for years ! they are one of those things which make for ideal 'pottering' - I can lose hours prodding about with them ! 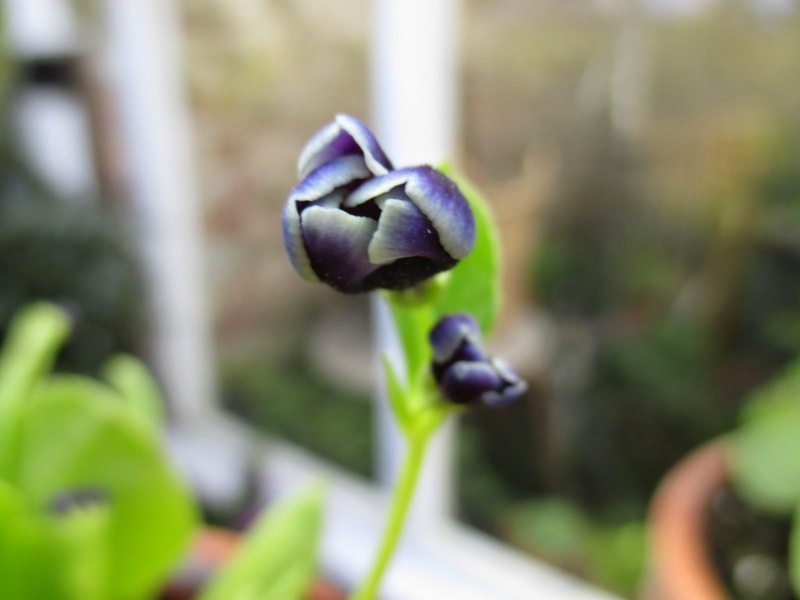 as you to your Auriculas, so I to my pots of indigenous bulbs. Very quiet, then show time! Absolutely, Diana ! Zilch for 11 months, then it all happens at once! I think these flowers are fabulous, even though I don't grow them. Such beautiful colors, and such an interesting bloom form. I like terra cotta over plastic, too - although I understand the arguments for plastic. I guess I just like the classic look. 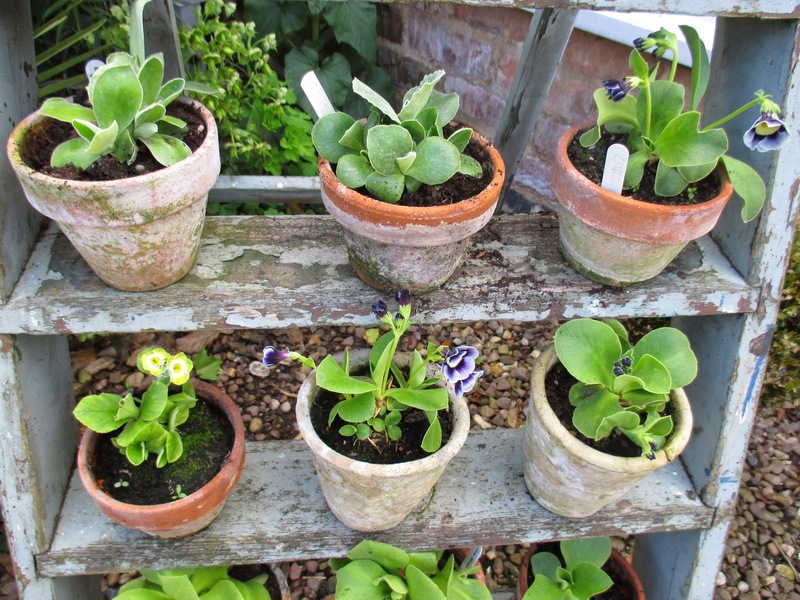 And the auriculas in terra cotta pots are definitely classic! Two weeks away from the garden is a long time, as changes in the garden happen daily. But it's always fun to see the garden with "fresh" eyes. Hi HolleyGarden, I think they are real 'marmite' flowers, in that you either love them or hate them ! I agree that terracotta is the classic look, for anything in the garden really ! Nothing else compares. It's lovely to be back in the garden again, I miss it so much when I am away! Amazing flowers. I love the slightly fake, other-worldly look of them. I suspect they wouldn't do well here (very few primroses and their ilk do), but it sure is fun looking at them. Interesting history, too. 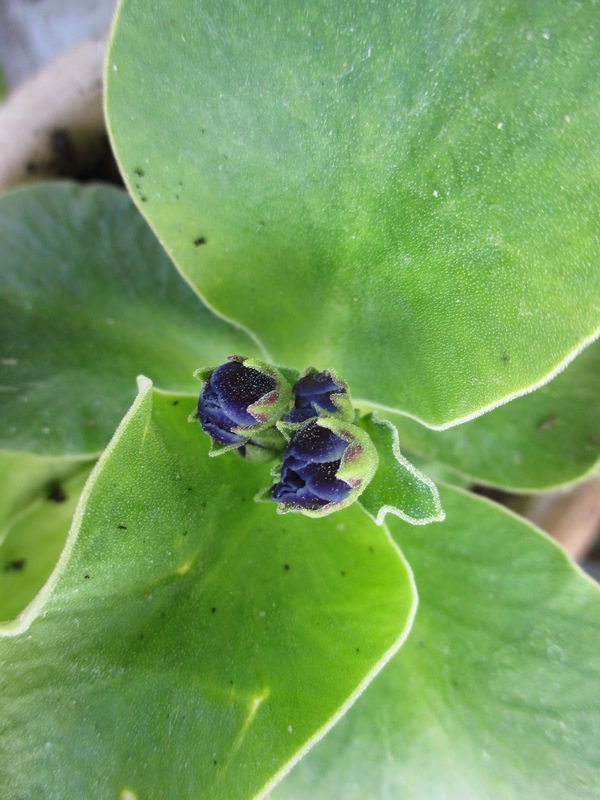 You certainly know your Auriculas. I don't grow any myself, nor do I think they are common in gardens around here, but I do see the appeal. As to pots, I like the look of terra cotta but they are very apt to crack in this climate. 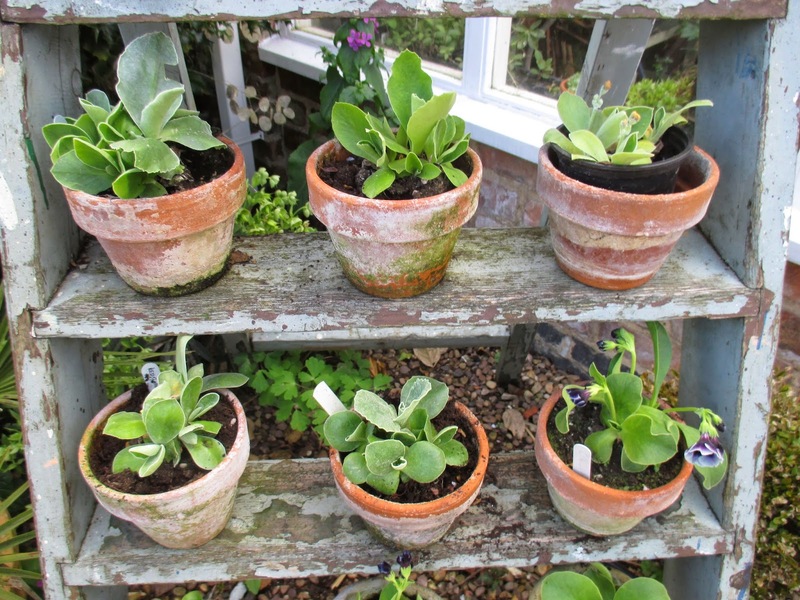 Hi , I wonder if Auricula growing is a very British thing ? No one else really seems to grow them other than we Brits ! sadly the terracotta pots crack here in the frost as well ! Some are termed 'frost proof' but in my experience they are not !! They are such beautiful flowers, but I have never been very successful with them unfortunately. Love your steps turned into a theatre for them, that is a very neat idea! Hi Pauline, I am interested that you have not been able to keep them successfully, as I have read that they are difficult, but for some reason they are thriving on my neglect at the moment!! It will come to a sticky end I'm sure ! 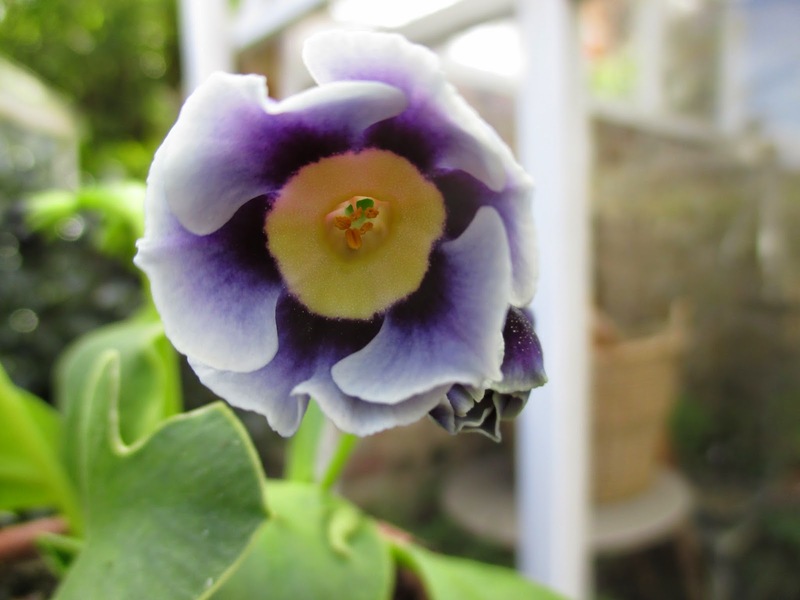 Great close ups of the auricula flowers Jane, they are truly beautiful. 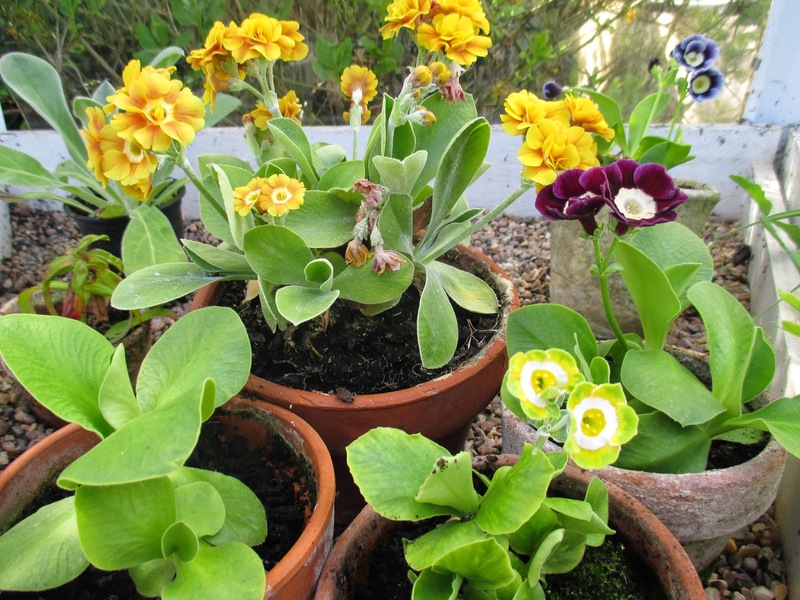 I love my primulas and grow many different species but I am unable to grow any of the European species in the open ground as my soil is quite acid and, for the most part, those such as the auriculas originate on limestone. I have never grown them in pots although that would be the way to go and your pictures have me thinking I might try in the near future. Hi Rick, go on... give them a go in pots ! Easy peasy so far ! Hope you had a nice vacation. I have never been to the southern states. 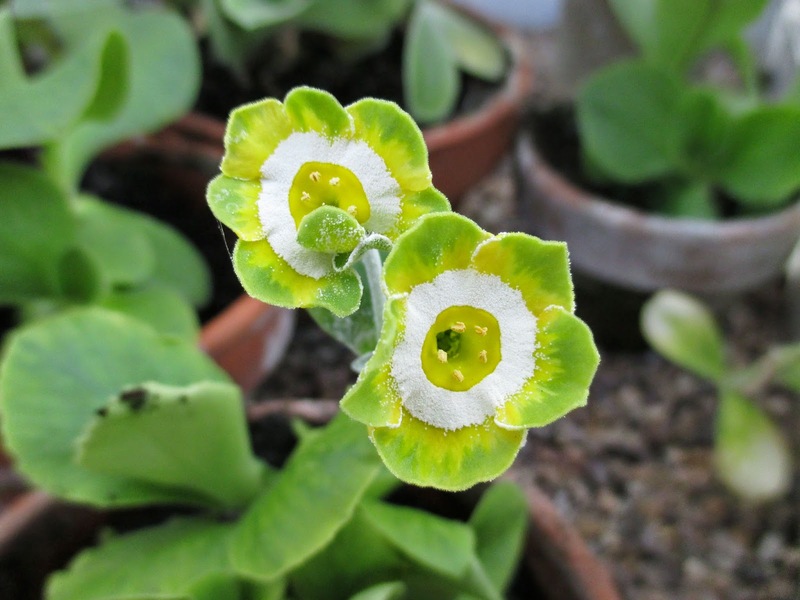 Your Auricula collection is wonderful. I really like the little stand you have to display them. I think they look perfect in the little terra cotta pots and can't imagine they would have the same charm in plastic. It was fantastic thanks Jennifer - Atlanta, nashville, Memphis and New Orleans with lots of other stuff in-between! I agree that plastic pots can never match with terracotta ones. I love the way they age !